A century-spanning star for 4 of the sport's oldest franchises, Tommy Leach played third base and outfield from 1898 to 1918. 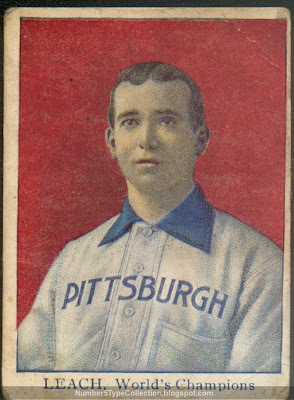 This 1910 set marks his only championship, but he also appeared in baseball's first modern World Series (1903), collecting its first hit and scoring its first run. Value: I picked up this antique from eBay about four years ago for $225. 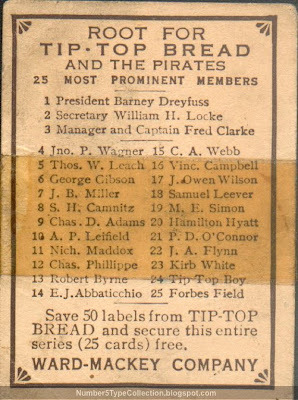 Check out a Robert Edwards Auctions listing for the whole set to see more pictures, including the anachronistic apron-wearing Tip-Top Boy Mascot. Fakes / reprints: The set's valuable enough to fake, so don't make it your first early 20th century purchase--research others from the era first and get familiar with how authentic paper and ink looks. Buying from a reputable dealer also helps. 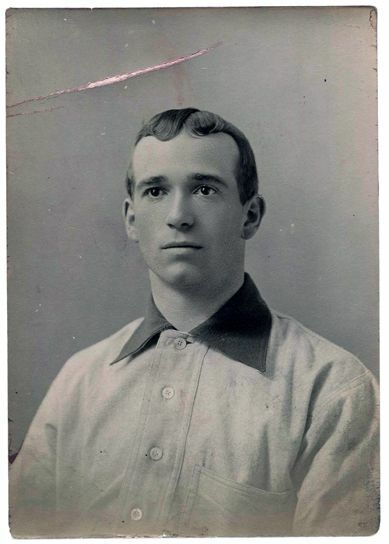 UPDATED: Paragon Auctions posted the original studio shot for this Tommy Leach card and probably others from the same era. Note that Tip-Top's artist added PITTSBURGH to his otherwise unadorned uniform.